It's too hot. Too hot to bake, too hot to even WANT to bake. Plus, my recent attempts have not ended so well. I made yesterdays Dorie treat twice in the last month and somehow forget to take a picture either time? Plus, they came out over cooked and gooey at the same time- BOTH times (tasty though)! So right now at our house, it's all about quick, low heat meals. I'm not kidding when I say I ate this salad three nights in a row! I normally try to have "vegetarian night" about once a week but unless my Tall Man wants to fire up the grill, almost every night has been vegetarian night around here. While you could certainly add some shredded rotisserie chicken, this salad is so good I don't think you'll miss the meat! The berries are cheap and delicious right now- you can use whatever you find. The goat cheese is tangy and cooling at the same time. And best of all? The only appliance needed is the blender to whirl up the dressing! Combine all ingredients in blender or food processor until perfectly smooth. Keep refrigerated for up to two weeks in a tightly sealed container. For obvious reasons, I get a kick when you post strawberry recipes. Oh yum! And I LOVE the red and white plate you have displayed your salad on....gorgeous! I LOVE this kind of salad. My husband calls it "Relief Society" food. We used to live in Tucson, so I hear ya about the heat and baking! Yum! 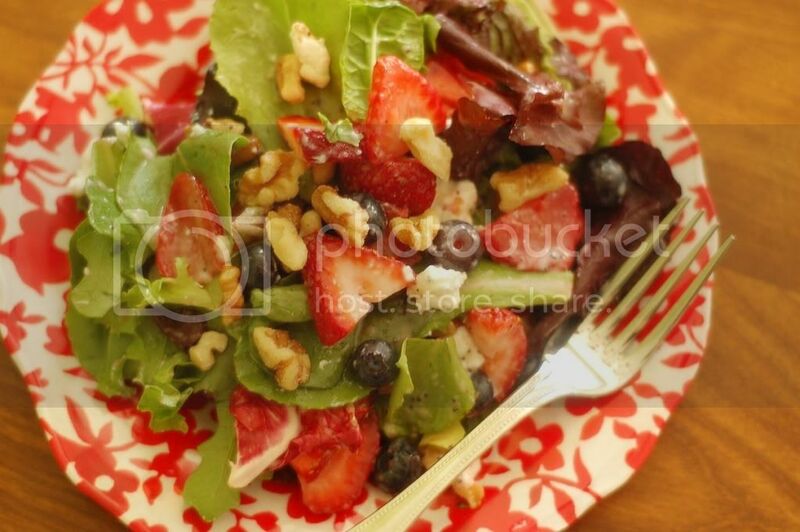 That looks like a delicious summer salad. I need to make it sometime, when I do potlucks or have people come over. It looks very pretty too. 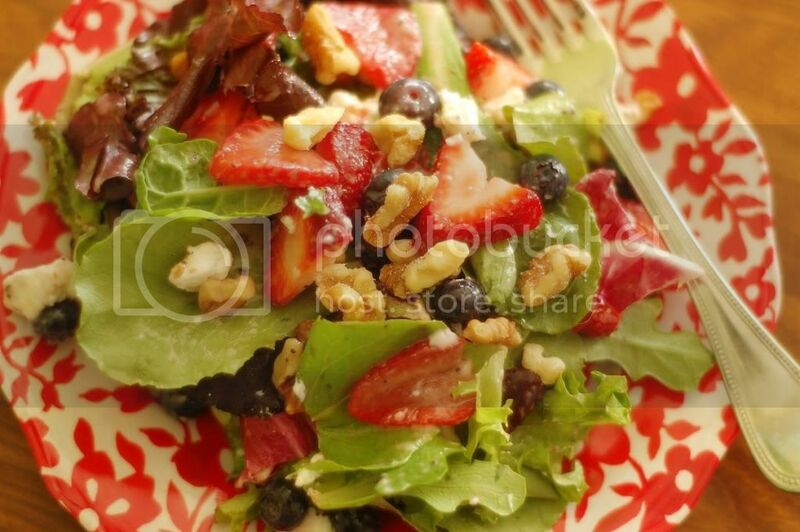 The salad looks so deliciously refreshing. This is a completely perfect salad in my book, Anne. Really beautiful, sweet and nutty, full of cool freshness. Looks absolutely wonderful. And your dressing recipe is one I also want to try. Very nice in every way.